Chop it -- While it is illegal in Michigan to move or bring firewood from quarantined areas to a campground due to tree maladies, there is plenty of wood to be found for sale at campgrounds and neighboring areas. Instead of purchasing pre-chopped wood, buy a log and split it yourself and burn an average of 400-500 calories an hour. Park it -- When choosing your spot at a campground, pick a site that requires you to walk a bit further to the camp store, bathroom and shower facilities and trash disposal area. Your fitness tracker will appreciate it. Outdoor gym -- Use a brawny tree branch for pull-ups, a fallen tree branch to do lateral hops and a sturdy stump for step-ups. Do enough reps to get your heart rate up, apply bug repellent and sunscreen and don't forget to stay hydrated. Many MARVAC campgrounds offer activies that can help guests work off an extra s'more or two. At Greenwood Acres, www.greenwoodacrescampground.com, in Jackson, Michigan, visitors can burn more than 200 calories an hour participating in the horseshoe tournaments that go on all summer long; or more than 400 calories an hour swimming laps in their Olympic-size pool. The tennis and basketball courts are also great ways to burn off camp store snacks. 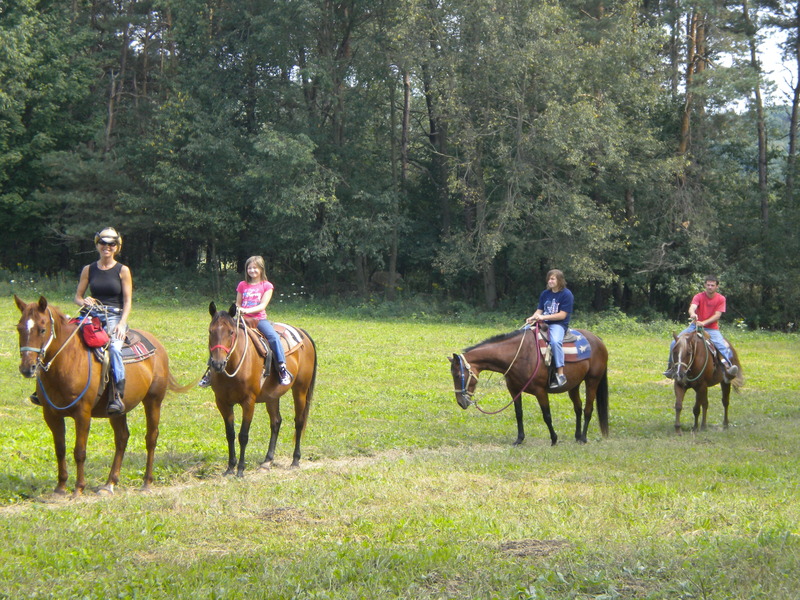 A horseback ride at Double RR Ranch in Belding, Michigan, www.doublerranch.com, will shave off more than 200 calories an hour; while a guest can work off 335 calories on the pickleball court at Sunny Brook RV Park in South Haven, www.sunnybrookrvresort.com. Of course, there are miles of trails and shoreline to walk along. Walking is considered one of the best exercises for people of all fitness levels and ages, so fill up a backpack with healthy snacks and water and get moving … there are s'mores waiting when you return. The Michigan Association of Recreation Vehicles and Campgrounds (MARVAC) is a statewide, nonprofit organization dedicated to encouraging growth in the recreation vehicle and private campground industries while contributing to the quality of Michigan tourism. For more information, visit MARVAC's website, www.michiganrvandcampgrounds.org. MARVAC, 2222 Association Drive, Okemos, Mich. 48864-5978; 517.349.8881. Horseback riding at a Michigan Association of Recreation Vehicles and Campgrounds (MARVAC) member like Double RR in Belding, Michigan is just one great way to keep active and burn calories while on enjoying a fun, family camping vacation!